On an auspicious Guru Poornima day, here is Umesh’s Samarpanam at HIS holy feet. · When I met Smt Chitra Subarmanaiam at Ganesa Sharma mama’s gruham in Mylapore Anusham pooja, she wanted me to do a painting of Periyava she saw at Pradosha mama’s temple gruham that day morning. · She said that she had prayed to Periyava that she would ask me to do this painting. And on the same day we met at Mylapore. · Before start, thought to add Pradosham mama. But was indecisive on Orikkai backdrop. Messaged her about adding mama, pat came the reply that she was in Orikkai. · For the entire painting, listened to Vikku mama’s experiences, Salem Ravi mama’s daily discourses. · Started painting but had long breaks in between for reasons best known to Him. 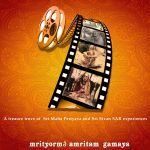 My amma and Smt Saraswathi Thyagarajan mami’s blessings helped to bounce back and continue. · When my friend Jegan went for Periyava Jayanthi to Pradosham mama’s gruham, he had shown to Sri Sriram, Pradosham mama’s grandson, one of my earlier paintings of them. · In June 2016, when Sriram anna was on a personal visit to Hyderabad, requested him to visit us. He obliged, visited us and saw my earlier painting and blessed for successful completion of current one. · I truly believe that without Periyava and mama’s blessings, that golden moment would not have happened. · Blessed 1.5 years of journey doing Periyava and Pradosham mama painting. Beautiful and amazing work! His blessings are always with you!! Thank You very much Shri Umeshji. Namaskaram. 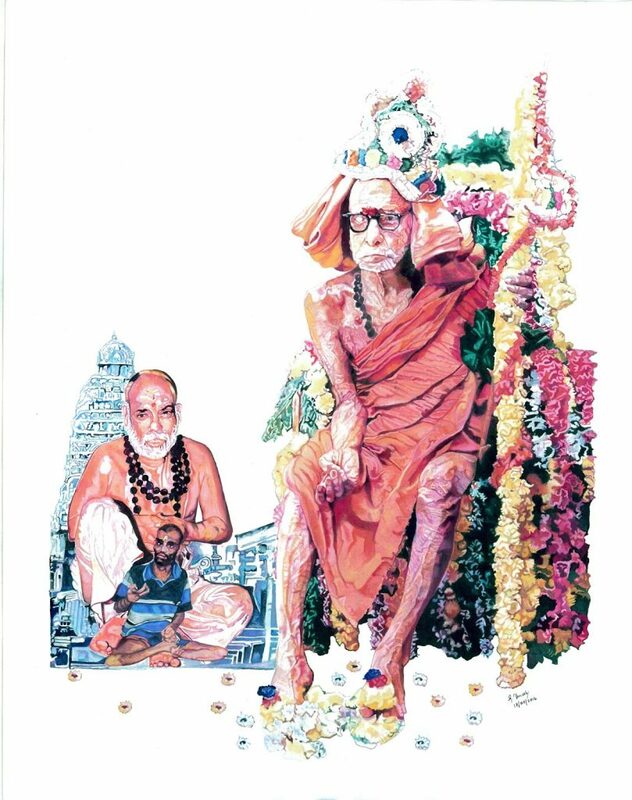 Such a brilliant painting to be published on this auspicious day of Guru (PeriyavA) Pournima! Mahaprabho Parameshwara!! Veda Vyasa and Veda Samrakshana PeriyavA Padma Paadham Saranam. Beautiful Periyava and Mama! — Tat – rupam ! Can anyone please tell me the meaning of the Mudra that Periyava has made using his left hand. I saw Periyava and the same Mudra in his hand in a dream almost 6months to an year back. Wonderful assignment completed with HIS blessings. Marvelous painting. Blessed to see it on auspicious Guru Poornima Day. Feeling blessed.